Courtesy of Robert Vidéki, Doronicum Kft., Bugwood.org. 1. Poison hemlock (Conium maculatum) is a biennial weed with fern-like leaves that can be easily mistaken for parsley. Like parsley, it is in the carrot family. The plant produces a number of toxic substances, but the most deadly is the alkaloid coniine – a neurotoxin that disrupts the central nervous system. Ingesting even the smallest amount can result in rapid respiratory collapse and death. One way to identify poison hemlock is by the purple-red blotches on its stems. Courtesy of John M. Randall, The Nature Conservancy, Bugwood.org. 6. Pennyroyal (Mentha pulegium) is an invasive species in meadows or wet areas. It is known as an insect-repelling herb and is sometimes used as a tea. 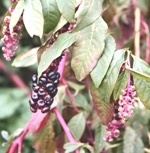 It is even found in some health food stores as an herbal medicine. But DiTomaso cautions that the weedy version of this plant is trouble if too strong a tea is made from the leaves. It can cause liver damage, lung damage and death. Courtesy of Richard Old, XID Services, Inc., Bugwood.org. 7. Meadow deathcamas (Zygadenus venenosus) and other deathcamas species are native perennials in the lily family. They tend to grow in forests or meadows. All parts of the plant are toxic. That includes its bulb, which is easily confused with edible wild onions. One differentiator between the two is that deathcamas lacks the distinctive odor typical of an onion. Courtesy of Tom Heutte, USDA Forest Service, Bugwood.org. 8. Foxglove (Digitalis purpurea) is an escaped ornamental plant that produces tall stems ringed with colorful bell-shaped flowers. The soft leaves at its base are easily mistaken for comfrey or sage but lack the distinctive smell of the safer species. This invasive weed is very poisonous. DiTomaso says it produces a chemical that can speed up and strengthen heart contractions. The leaves on the upper stem are particularly potent. Courtesy of Ohio State Weed Lab Archive, The Ohio State University, Bugwood.org. 10. Jimsonweed (Datura stramonium) is in the tomato and potato family. It produces a dangerous poison that can be fatal to humans and animals, including livestock and pets. Jimsonweed produces seeds that are highly hallucinogenic and can trigger bizarre and violent behavior. The Weed Science Society of America, a nonprofit scientific society, was founded in 1956 to encourage and promote the development of knowledge concerning weeds and their impact on the environment. For more information, visit www.wssa.net/index.htm.